Karate Throws to Warm Your Heart! so they could one punch a sucker. Put him to sleep for a week. they were ready for Mixed Martial Arts. you can one punch somebody if you do it right. because there weren’t any throws in it. 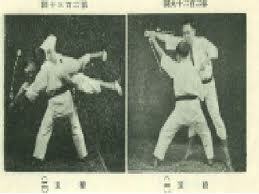 Gichin Funakoshi got together with Jigaro Kano. that he had not been taught by Jigaro. Yet the whole world thinks we don’t! Yet the founder of modern day Karate says we do. So why don’t we see many throws in Karate? so why teach them what they already had? to the culture that created the samurai. there could be a lot of reasons. and we didn’t have any ‘judo techniques’ style of motion. and take a guy down easy squeezy. top half goes the other. sideways movement with an arm throw. I could easily find a dozen throws in that form alone. and therefore to isolate the throws and present them as a matrix. in Matrix Kung Fu (Monkey boxing). is how we got in the mess in the first place. and suddenly they are trying to teach the elephant style of Mantis. And it doesn’t make sense! if you try to teach them from a single viewpoint! then the arts become small and bite sized. the specific concepts of their arts. But that’s not the unique concept of Karate! ‘Tai Chi Kung Fu is soft,’ they say. and people are left to dig their way through the mess. kept separate form other influences. and made into a whole. to master the martial arts. the whole art can be absorbed quickly and smoothly. Mastered in a couple of years. Matrix Kung Fu is virtual all the standing up takedowns in the martial arts. from the throws that are there. and all you have to do is turn and enter. It’s on the menu of Monster Martial Arts. especially if you are on it. And I’ll talk to you next Friday. This entry was posted in american kenpo, Black Belt Course, funakoshi, gichin, home study martial arts, karate, kenpo, kung fu, mantis, Monkey Boxing, ninjitsu, real karate, real kung fu, real martial arts, shotokan and tagged best karate, gichin funakoshi, jigaro kano, judo techniques, judo throw, karate style, karate throw, karate training, kyokushin, mixed martial arts, shotokan throw on May 27, 2013 by aganzul. Learning Kung Fu is Hard When You Have to Overcome Yourself! I should say the odd thing about teaching human beings, not just teaching kung fu or karate to some fellow. But the fact is…people refuse to accept information. Now, this is a big deal, actually, can result in damage, but so many systems use the twisting wrist to teach beginning students…but, they don’t teach the white belts why, or how to transition the technique to a more stable punch. You see, the wrist is unstable, but it teaches people how to focus their power. Once they learn how to focus their punches, they need to learn how to snap a vertical punch, what is called a ‘sun’ punch, or some other variation. But when you tell them that, the mind shutters. They shake their head, and continue on their path, and it is as if you never spoke. It’s not just karate or kung fu, it’s deeper, it goes to the person’s ability to listen, to actually process information. That is, incidentally, why the martial arts are so vital to learn. Somebody disagrees, and you can show them on the dojo floor. You can make them open up their ears. But, that doesn’t cure the person of his problem of not being able to listen. Even somebody who has studied the martial arts for decades has this problem. Here is the thing they will actually think when you tell them something. ‘Oh, we have that in our kung fu style.’ Or Karate style, or whatever. They don’t say it, they just get this smug look. But the truth is this: yes, they had it in their kung fu style, every system has everything, if you look far enough, BUT…they were not aware of it before you spoke of it. Simply, people won’t let go of their ignorance. They protect it; they are not willing to admit it because, darn it, they think it will make them look like they aren’t smart! But holding on to your ignorance is what is not smart. If you don’t admit your were ignorant of something, then you can’t learn: your protection of your image as somebody who is wise and knowledgable stops you from learning . Now, go ahead and peruse Monster Martial Arts. Hopefully, what you have read here has removed you from that attitude, and opened your cranium to the influx of new ideas. Because, I guarantee…the stuff you find on Monster, this Matrixing science, has never been seen before. It is brand new information, not written of by Bruce Lee, nor recorded in Ninja scrolls, not anything. Brand spanking New, and that makes it very difficult for people who are more concerned with their image of themselves than their desire to learn kung fu, or any other martial art. This entry was posted in american kenpo, Black Belt, Black Belt Course, gung fu, home study martial arts, jeet kune do, karate, kenpo, knife fighting DVDs, Martial Arts, martial arts weapons, pa kua chang, real aikido, real martial arts, shaolin, tae kwon do, Tai Chi Chuan, zen and tagged karate style, learn aikido, learn karate, learn keno, learn kung fu, learn Shaolin, learn taekwondo, learn tai chi chuan, punches, vertical punch, white belts on May 18, 2013 by aganzul.